LG 50PK990 review | What Hi-Fi? colour palette sometimes hits wrong note. We first looked at this TV a few months back and were knocked out by the form and function on offer. You paid a fair old premium – originally it was £1600 – but it had a bang up-to-date specification that did the sleek styling justice and delivered a performance that had us viewing our 50in Pioneer Kuro in comparison. A lot can happen in just a few months. Now there are new models from Panasonic and Samsung to test the LG's previously five-star performance. But the 50PK990 has an age-old trick up its sleeve when it comes to staying on top of its game – a not inconsiderable drop in price. This set is now down to around £1200, and you can find it even cheaper in places, so we're all set for this LG to give a strong account of itself again. The ability to deliver 3D content hasn't miraculously appeared, but otherwise this set boasts an exhaustive spec. Internet TV is catered for by LG's NetCast service – though like Panasonic's offering, it's limited to the likes of YouTube and Picasa. It is, however, DLNA-enabled, so you can stream content from connected devices on your home network. You can even go wireless with LG's optional wireless USB dongle. There's a USB input that's compatible with video files as well as audio and pictures, and even Bluetooth connectivity for streaming audio to and from compatible devices. In all its shimmering, glassy glory, this set is something of a stunner. The remote, with its clearly marked buttons, gives an indication of the set's usability. And the interface that greets you is every bit as easy to use, with big, simple icons, within which menus are equally clearly presented. The Freeview HD tuner delivers clean and crisp images, not least from the HD channels, while the sound quality is relatively good – in this company – with plenty of weight and power to set alongside clear, authoritative dialogue. 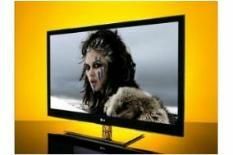 This is particularly so when you enable its Clear Voice technology – a nice touch when most TVs sound so poor. Switch to video, and Date Movie delivers a brash and vigorous palette for the 'PK990 to contend with. Skin tones and close-up shots can at times be perfectly judged, with attention to detail and subtlety in abundance, but comparative testing with newer rivals uncovers chinks in this LG's picture performance armour. Why? Well, the brightest whites aren't quite as clean as the best, and colours at times don't hit quite the right balance: bright greens lack a little depth, while reds seem over-cooked. They're small criticisms, to be fair, but in absolute terms,newer sets pip this LG. This remains a stylish, well-specified set, and a pleasure to use, too. But despite the drop in price, it's been slightly pipped by new arrivals for pure picture performance.